Eenie, meenie, miney, moe -- where should my cash savings go? That's the riddle many Americans are trying to figure out these days. After the necessities are taken care of -- food on the table, credit card debts paid off, emergency fund funded -- it's time to choose: mattress, stock market or mortgage? Do the math, and there's a clear winner: The average rate on a one-year CD is 0.34%. The dividend yield on the S&P 500 is an anemic 2%. The rate on a 30-year mortgage is 3.95% -- more than 3.6 percentage points more than the CD and almost 2 percentage points better than the S&P. In other words, the return on paying off your mortgage, compared to other uses of money, has risen. As always with paying off debt, reducing your mortgage is a guaranteed return. It's especially worth considering if you have a large amount of cash you're not comfortable investing in stocks and bonds. If your mortgage is paid off by the time you reach your 60s, you'll need less retirement income, since you'll have eliminated one of your largest expenses. This may allow you to retire earlier, and it should help your nest egg last longer. The less income you need in retirement, the fewer investments you have to sell and the less money you have to withdraw from tax-deferred accounts. This will likely keep your tax bill lower. If you're paying private mortgage insurance, the sooner you build up equity in your home, the sooner you can stop paying that approximately 0.5% of your mortgage each year (for many homeowners, that expense is not deductible). You'll have the peace of mind that comes from being mortgage-free. As financial journalist Jean Chatzky has written, "I ... know from research I've conducted over the years that having debt makes you unhappy. It makes you unable to sleep at night. It stresses you out. Particularly when your income is going down -- i.e., for most people in retirement." You can earn a higher return on your investments than your mortgage rate. Given how low current rates are, this hurdle doesn't seem that difficult, though you'll have to take some risk because cash or a bond fund isn't going to do it. You receive a significant tax advantage; mortgage interest is deductible if you itemize. However, keep in mind that the true tax benefit is limited to the extent that your itemized deductions exceed the standard deduction, which for tax year 2012 is $5,950 for single taxpayers and $11,900 for married taxpayers; those age 65 or older get an additional $1,450 (if single) or $1,150 (if married) deduction each. Also, mortgage payments progressively consist of more principal and less interest. Thus, the amount you can deduct declines each year. Bottom line: The mortgage-interest deduction can be valuable, but don't overestimate it. You value keeping your investments liquid (i.e., easily accessible), perhaps because of inconsistent or unreliable income, tenuous job security, or the peace of mind that comes from a fat bank account. Once you send a payment to the mortgage company, it's not easy to get it back. 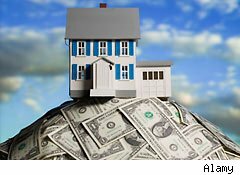 You'd need to take some form of home equity loan, which would take time and entail up-front and ongoing expenses. The first financial priorities for most people should be to build an emergency fund, pay off credit card and other consumer debt, and max out tax-advantaged retirement accounts. But once you have those taken care of, paying off the mortgage early is worth considering. Conservative investors and those close to retirement might even consider paying off the mortgage before contributing to an IRA or 401(k), as long as they're not passing up an employer match. If you're younger, the math is more in favor of keeping the mortgage, since you'll be investing in long-term investments that have more potential to outperform the rate of your home loan. As you approach and enter retirement, your portfolio should become more conservative -- which means that consistently earning even 3.95% is not a sure thing. Robert Brokamp is a certified financial planner and lead adviser of The Motley Fool Rule Your Retirement service.